Lee Jackson has had an interesting football career. He arrived at the University of Texas in 1998, in the same year the school hired coach Mack Brown. 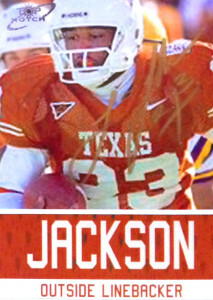 He overhauled the defense, and Jackson got the nod at Free Safety in 1999, and was named as Texas’ Most Outstanding Defensive Newcomer. In 2000, things went sideways when Jackson suffered a nagging season long hamstring injury. Buried on the depth chart, Jackson was given an opportunity to shift to linebacker by the coaching staff in 2001 and after an encouraging Spring things were looking up. Lee then had a toe injury that sidelined him for the season. In the meantime the Longhorns saw the emergence of All American Derrick Johnson at linebacker. Still it was onward and upward for Jackson in 2002. With a full injury free season at linebacker in 2003, Lee capped his career recovering a pair of fumbles and returning one 46 yards for a touchdown to help the Longhorns earn a 35-20 win against LSU in the Cotton Bowl. With an intriguing pro day, Jackson became a priority free agent after the 2003 draft. He’d be signed by the Tennessee Titans but did not make the squad. Jackson quickly found his footing… as an actor, joining the cast of Friday Night Lights. Lee is frequently seen at UT events- or at least the ones I go to. I first met him way back at the UT Neighborhood Alumni Bowling Tournament in 2013. He and I just sat there chilling while everybody else bowled talking about football. Later I ran into him at the grand opening of Derrick Johnson’s new sport performance gym in 2014. I caught up with him and I brought up football cards and how he was on Tecmo Rose Bowl. He was excited to know I was involved with those things. It took me a long time to find a photo, but eventually I got his card made. In 2016, I ran into him at the Mighty Fine event and gave him his card. He was very touched by what I did and I know it meant a lot to him. We exchanged pleasantries and talked for about 15 minutes. Some of my fellow collectors call him ‘Hollywood Longhorn’, but I scoff at that notion, because Jackson’s career contributions are frequently overlooked due to his injuries and position changes. To me, his LSU game alone justifies him in any course.